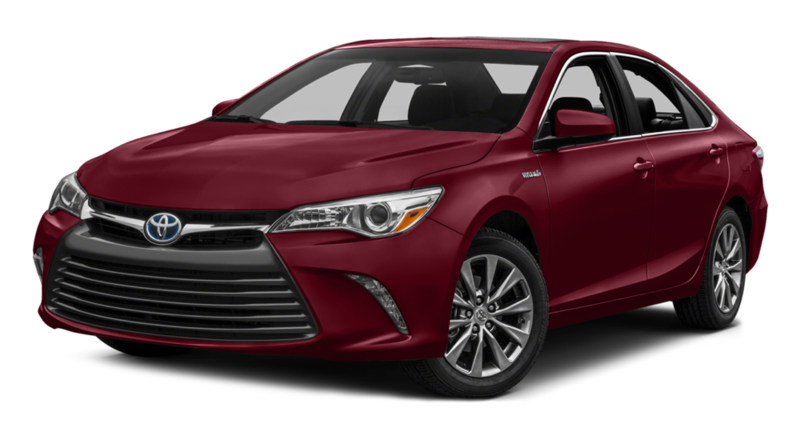 Santa Ana, Culver City, and Manhattan Beach drivers who think they have to choose between fuel-efficient performance and first-class comfort will be pleasantly surprised by the 2017 Toyota Camry Hybrid. 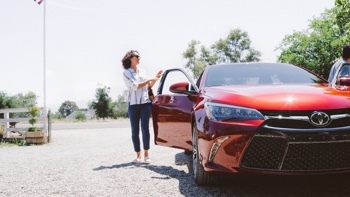 It delivers forward-thinking technologies and a thrilling drive while sipping fuel and topping safety segments, and you can find yours today from Marina del Rey Toyota. The Toyota Camry retains the same price for 2017, but it also offers more standard and available features. Most attractive is the addition of an Entune Multimedia and Navigation system at no added cost, and the XLE trim now comes with Qi Wireless smartphone charging. Toyota has even added a couple of extra exterior colors into the mix for your consideration, including Metallic Blue. 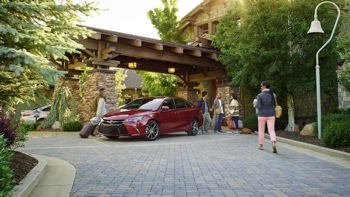 The Camry Hybrid’s celebrated Synergy Drive system combines a sophisticated 2.5L four-cylinder engine with an electric motor and a battery pack to produce up to 200 hp. The vehicle’s fusion of lightweight materials and refined aerodynamics combines with this output to produce the kind of spirited and engaging ride you just wouldn’t expect from a hybrid sedan. Of course, efficiency ratings are the Toyota Camry Hybrid’s true draw. It achieves up to 42 mpg in the city and 38 mpg on the highway,* or 40 mpg in the city and 37 mpg on the highway* with the XLE, so you’ll find yourself passing more gas stations than ever. There’s even a handy Eco Display that delivers real-time information concerning how power is being routed to the drive wheels or how the battery is being charged. 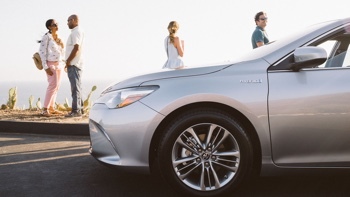 The Camry Hybrid’s top-of-the-line mpg ratings reflect its position as of the most fuel-efficient vehicles available around Culver City and Manhattan Beach. However, it also sports a compelling interior that offers plenty of space, so you’ll never feel like you’re driving something designed purely for efficiency. The front sport seats use side bolsters to cradle the driver, and you can choose between either ultrasuede or sport leather-trimmed seats to ensure maximum comfort, with red stitching or rich wood-grain style accenting available to add an extra dash of class to your interior. Sculpted cutaways in the seats and interior panels have been added to increase legroom for passengers in both the front and rear, and the headliner has been reshaped for greater headroom. 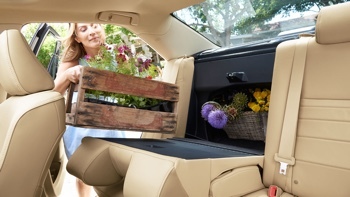 Unlike previous hybrid models, the Camry allows drivers to carry plenty of cargo thanks to a 13.1-cubic-foot trunk. Qi Wireless Charging: If you find yourself with only a slim red bar left on your smartphone’s battery meter, just pop it on the Qi nonslip surface to have it charge up wirelessly as you drive. Entune App Suite: Access music, reserve tables, pick up theatre tickets, or receive all the latest news concerning sports scores, stock values, traffic, and even fuel prices with this infotainment system. Nav System with Traffic: This system uses HD Radio technology to provide real-time information on the traffic flow in your area, and can even predict traffic before it happens and suggest an alternate route. The 2017 Toyota Camry Hybrid provides everything you’d demand and plenty that you wouldn’t even expect. 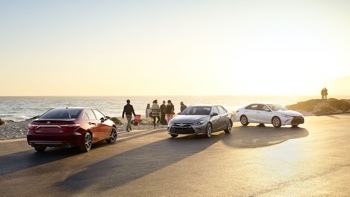 To take one out for a test drive, simply pay a visit to Marina del Rey Toyota today. Our dealership is located at 4636 Lincoln Blvd in Marina del Rey, CA, and you can call us at (310) 439-9894.